What Day Of The Week Is June 3? 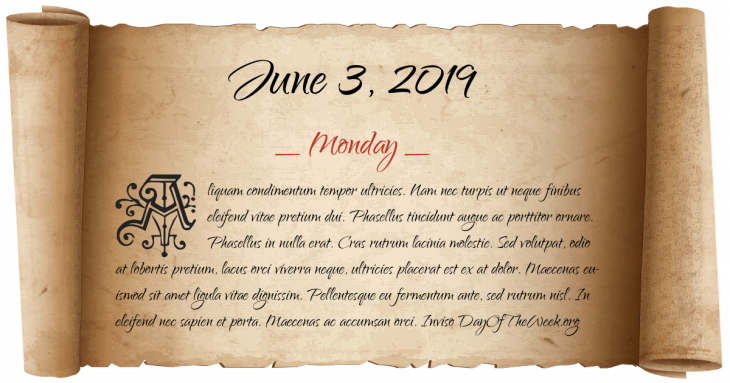 June 3, 2019 is the 154th day of the year 2019 in the Gregorian calendar. There are 211 days remaining until the end of the year. The day of the week is Monday. The Dutch West India Company receives a charter for New Netherlands. An Air France Boeing 707 charter, Chateau de Sully crashes after an aborted takeoff from Paris-Orly Airport, killing 130.
Who were born on June 3?